What better way to start a new year than to review events of the last quarter and see what the indicators tell us about how Morocco is progressing. 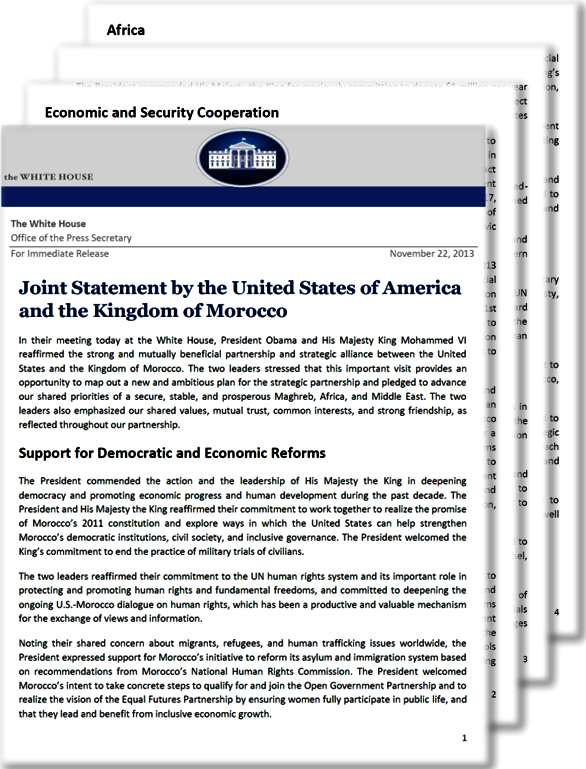 The highlight of 2013 was, of course, the meeting in November between President Obama and King Mohammed VI to renew and upgrade the bilateral partnership. The well-crafted diplomatic statement that was released detailed modes of cooperation and coordination between the two long-time allies, and several agreements were signed or announced that defined the way forward. The momentum of political reform includes broadening opportunities for greater civic engagement by Moroccans at all levels, complemented by increased economic activity that deals with the central issues of unemployment and market related education. The Moroccan economy has been negatively impacted over the past three years by the decline of investments from and exports to the Eurozone, as well as fewer remittances from Moroccans working abroad. To offset these trends, Morocco is greatly expanding its presence in Africa and broadening its development agenda to support greater political and economic participation. And it is in the areas of employment promotion, greater opportunities for women, capacity building for civil society, and political party reform that USAID is poised to make important contributions under the new plan. As detailed in the CDCS, USAID believes that it can work with partners throughout the country to help reach Morocco’s development goals. “Due to the experience of past projects in Morocco and civic participation best practices from work done around the world, USAID is in a unique position to help Moroccan Civil Society Organizations (CSO) and public institutions nurture civic participation in public decision-making during this critical juncture in Morocco’s democratic evolution. From issues of workforce development to civil society capacity building, USAID has worked with stakeholders throughout Morocco to define a multifaceted strategy on the issues of employment and capacity building. “USAID is proposing to enhance youth employability by focusing on the transition from education to employment for university and vocational students and recent graduates. The Mission will take an integrative approach to help Morocco adopt demand-led education and training systems that are both flexible and aligned to high-impact sectors and industries.” Projects described in the CDCS supplement existing programs, collaborate with a variety of stakeholders, and have a particular focus on raising opportunities for women. Rather than focus on specific sectors, which is being done by other donors, government agencies, and private industry, USAID resources will target potential employees regardless of their industry or service. Drawing on its global experience, communicating broadly and collaborating with stakeholders, providing data and metrics that will facilitate best and sustainable practices and taking an integrated strategy in delivering its programs and projects will enable USAID and Mission Director Dana Mansuri to further enhance their effectiveness as proactive partners in Morocco’s development.